It's also 50k+ digital (38k first month, 11k second month), pretty impressive how it's holding so far, is it Platinum developed best selling title or is Rising still ahead? Btw how come PS4 rising in last couple of weeks? its not getting any releases either. Or the 19k anomaly was due to some sort of shortages? 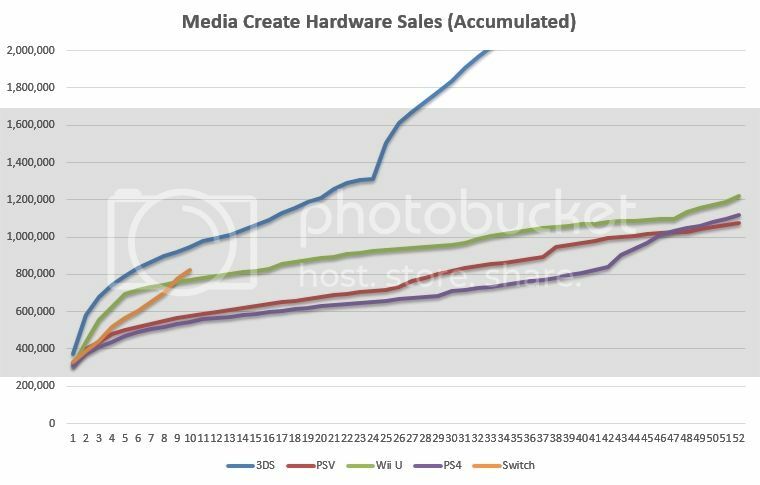 maybe golden week actually helped selling more consoles? I think Nintendo just wants to see how straight of line they can make on Hiska-kun's graph with the Switch. It was last week, correct? Hence the Switch decrease this week? But then what would explain the XB1 bump? Or is the Switch decrease due to stock? Or is the Switch decrease due to stock? This. They had extra shipments the week before due to the launch of MK8. Now it's back at it's normal being-sold-out baseline. Ah, makes sense. Seems a little backward but that's Nintendo for you. Thanks! From what i see, Sega is actually taking the diversifying business really seriously. Their Paradise City Casino Project if done properly is going to be their biggest money maker in the future.O_O They are also collaborating with Sheraton for a convention center and resort in Japan. I guess that is not surprising how Sega Pachinko business is kinda in down line/stagnating that they are going to jump into Casino business outside of Japan just like Konami. On Sega mobile game venture, it seems that their two latest release which is World Chain and Soul Reverse Zero is not the hit they wanted as they still emphasize more on Chain Chronicle and Hortensia Saga as their biggest mobile hit till now. I am actually more intersted with Sega new partnership with Universal Entertainment called Zeeg. Thats.... an underwhelming Golden Week sales. I'm guessing a lot of those X1 sales came from Amazon JP. They had a pretty good GW sale on it. The 30,000 yen 500GB X1S Minecraft bundle had a 5,000 yen off coupon. Also if you had previously purchased a 360 or the original X1 via Amazon then you would get an additional 5,000 yen off (total of 10,000 yen off max possible). If I had purchased one of my 360s or old X1 from Amazon I probably would have ordered the bundle for my gf as 20,000 yen would've been a great price. I currently have the 1TB X1S Halo bundle that was sold before, myself. I guess I'll stick with my current plan of picking up Scorpio when it releases and giving my gf my current X1S. It's not that sad, I like casino and arcade too. Nier is so good, it deserves to keep selling for the entire life of the PS4. Nintendo and Minecraft are too greedy, hogging all the evergreen glory. Awakening had sold 1.9m worldwide as of December 2014, while Fates had sold 1.84m worldwide as of March 2016. So I think it's safe to say they're both over 2m at this point, or at least really close. Granted, FE Warriors isn't going to pull those numbers, but given that it's on the Switch, which seems to be a successful platform thus far, I can see it doing respectable numbers. And currently I think there is much more appeal in the Fire Emblem brand than the Dynasty Warriors brand. But we'll see. 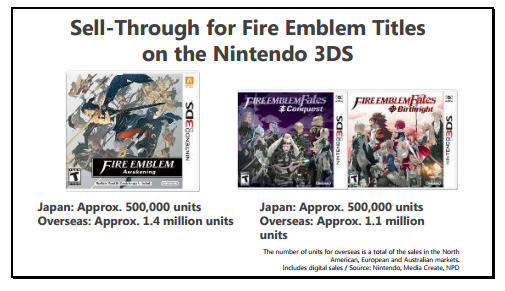 Apparently Fire Emblem Fates actually had pretty bad sellthrough given that shipment number was before the European launch, but these numbers were as of Nintendo's Q3 fiscal call. Fates was weird if I remember correctly. Because you could buy the other version for $20 digital if you had a physical copy. It advantageous for Nintendo that there are going to be very few releases like Zelda on the Switch during first half of 2017 the games so far announced are mostly multiplayer. If the Switch does as well as the 3DS's launch year than there is a potential 3 million owners that would be looking at games to play. When someone buys a Switch for Splatoon 2 or MK8D why wouldn't a high number of new owners also buy BotW. If just 1 in 4 of the potential new owners buys Zelda it should do another 750K in Japan. We've never seen that much Nintendo legs with a Zelda title in Japan before but the Switch and BotW provide a very unique second game for a someone that gets their Switch during summer vacation for Splatoon 2 or on Christmas. If the Switch sales over 4.5 million than obviously Zelda wouldn't even need a 20% attachment rate to easily pass a million. If Nintendo is able to ship 14 million Switches in 2017 than surely at least 5 could be shipped to Japan. The question is whether Switch would maintain the type of performance needed to reach this goal. It would basically require 100K on average for the rest of the year to sell 5 million . To me it's something that is feasible provided Splatoon 2 is a game changer. I mean a lot rests on Splatoon 2 to really outdo the debut on a system that seems so much more fitting for the Japanese market. It would be 500K more than I predicted but it all depends on supply and stock situation for Splatoon 2 launch, summer vacation and December. Weak numbers all round. BotW should be passing 600k in 2 weeks. Beyond that is the real test because I really think it's going to get harder and harder to sell it with every other new Switch from here on out. Especially as we approach the release of more multiplayer friendly games. I had hard time seeing it will stop selling there. Even if multiplayer games like ARMS and Splatoon 2 drop, some of those new buyers is surely going to want to look some AAA beefy single player experience game too to add on their purchase there and Zelda seems prime to take advantage of those buyers. I do wonder if Second hand market in Japan is going to cut the leg short though as Second hand market is very aggressive in Japan. It's pretty unheard of to not count digital sales these days. I would guess it was more where the 3DS was in its lifecycle. I had a lot of posts questioning if it could live up to Awakening's sales prior to launch due to the 3DS's age (and got yelled at a lot for them), but while it had a really great debut and follow-up month, I think the audience that was buying tons of 3DS games in 2012 had largely moved on by then, limiting final sales. I'm guessing Europe also went exceptionally poorly given the strong initial US performance. It is due Golden Week, no? Currently I only see Splatoon 2 possibly stealing BOTW's thunder, and even then it will remain the de facto single player game on the system. Not until the Fall do I see BOTW slow in down significantly tbh, and until then it can crawl quite close to 1 million already (at least 800k I think). Until they manage to supply more than ~45k to Japan in a week. Or until they manage to meet the demand... but with Splatoon on the way, if it doesn't happen prior to Splatoon, it won't happen after it for a while! ...Wait why the hell did Breath of the Wild on Wii U get such a noticeable bump? People saving their money for golden week? I think for Fates the shipments included the extra paths (which was why the JP shipment was so much higher than the sold numbers we have), but the sell-through did not (explaining why Fates is lower than the initial shipment from before the European launch). It's the only way the numbers make sense. But yeah, the legs don't seem to have been very good compared to Awakening, and it didn't seem to do too well in Europe. Doesn't sound realistic that the game shipped 1.84M as of NA launch and it sold 1.6 after coming to the EU as well. Something's clearly off with these numbers. Which of the two reports do you think Nintendo committed a federal crime in? If I had to guess, they just took stock back that didn't sell. The game was being sold off for pretty cheap at some points. Capcom has adjusted their shipments down quite a bit due to returns before, so it's not unheard of. Mass Effect 2 was also a game that shipped 2 million at launch, but still had 400K on store shelves months later with only 1.6 million sold through. It eventually sold much, much more than that, but it does happen. So, will switch manage 40k next week? Nintendo removed third version sales of Fates at second report. But the second path and third path as DLC had different pricing right? It should not be count as normal digital sales there. Unless i am understanding thing wrong here. Hmmm. I kinda disagree here but we would probably see when Splat 2 is release there. I think Splat 2 probably is going to hurt ARMS more rather than Zelda here but that is my only feeling. I feel second hand market is much much more dangerous to Zelda leg there. Ok, thanks for the examples. ME2 was a hugely successful game so it can happen indeed, i just thought it didn't make sense precisely because i remember everyone talking about Fates as a huge success that was supposed to surpass Awakening's numbers in no time judging from that start in both Japan and NA, so seeing that report was a bit of a wtf moment. Yeah this is in line with what i was thinking, i noticed that there are only Birthright and Conquest in that image and no Revelations as well but it's odd not to count it. Maybe it's also not counting the Special Edition sales then? I haven't been paying close enough attention apparently, but I didn't realize that Vita still > PS4 in Japan. If they ship more than 40k it will probably sell more than 40k. It depends if they counted the additional digital version sales as DLC or as a shipped game though. Companies rarely report on exact DLC numbers. 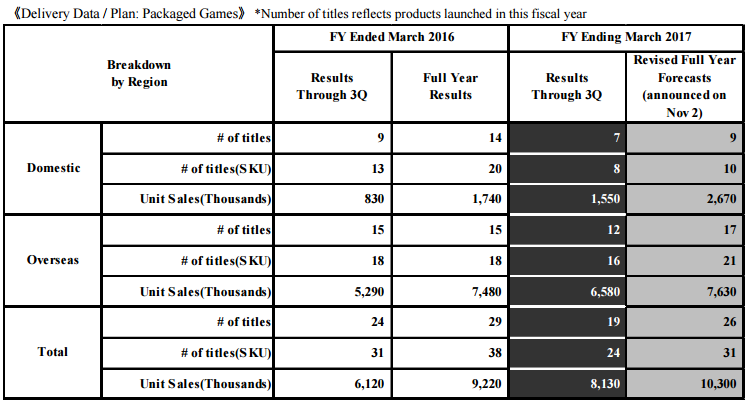 Konami did as well and overseas sales for videogames was far larger due to PES and MGSV iirc. KT lumps mobile and other stuff into the sales segment from what I see. What was 3DS supply like? MGSV is probably not something to use as a reinforcement point for any argument unless that argument is that Kojima wastes money and that breaking even is a good way to kill a franchise. MGSV's size of sales anywhere is pretty much irrelevant if the product turns out to be a lame duck for the company. They basically went flat in Japan and didn't see suitable growth in the RotW market. 47k new Switch owners: 9,5k of them bought the game, it's cheap so people will fall into that trap of just getting it along with Mario Kart and Zelda. Why? Its actually a pretty fun small party game for families. Its got an effective zero barrier to entry and any one can play it. No supply issues iirc, it just dropped in demand considerably. Like every other new system launch since Wii there was a shortage of demand. I don't think the 3DS had supply issues past the first 2 or 3 weeks. edit: or maybe never actually. They shipped a lot more units of the 3DS, demand for the system outside of Japan wasn't that high(way lower than for the Switch that's for sure). Switch would have sold the same amount if they could have shipped enough. I guess they roughly ship 50k a week to Japan alone at the moment and I wouldn't be surprised if the system will still be selling out for the next few months to come and I expect the Switch to outsell the 3DS within the next two months(in the same timespan). 3DS dropped rather harshly after the launch hype, as you can see in the graph already.